These offers are not avaiable all the time. But when they are Freezers are good! Clearly as we don't eat a vast amount of meat ( We can't really afford to ) This is going to be serveral days worth. Maybe a week? 5 meal portions for £2 each - I guess! Let's have a bit of fun. What have we done with this in the past?! Well what could / can we do with it? (2) Pasta Bolognese is idea for the minced Beef. 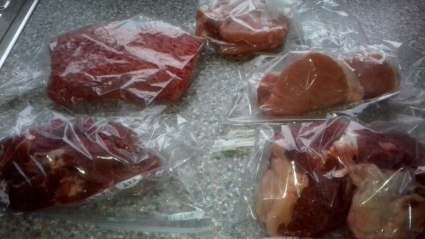 (3) Pasties are an option for the cubed Beef. (5) Then go a bit odd with Pork & Chorizo stir fry with the other chops! All the other ingredients are really very cheap. 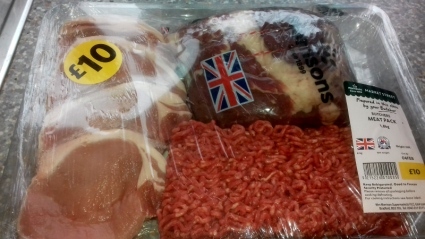 But if we can get 5 days out of a meat pack at £10 to feed us and Buster, you're not doomed!